Earlier this week, the U.S. Department of Agriculture’s Economic Research Service (ERS) published a report that looked at trends in the development of drought-tolerant corn in the United States. Today’s update looks at some key points from the ERS report. 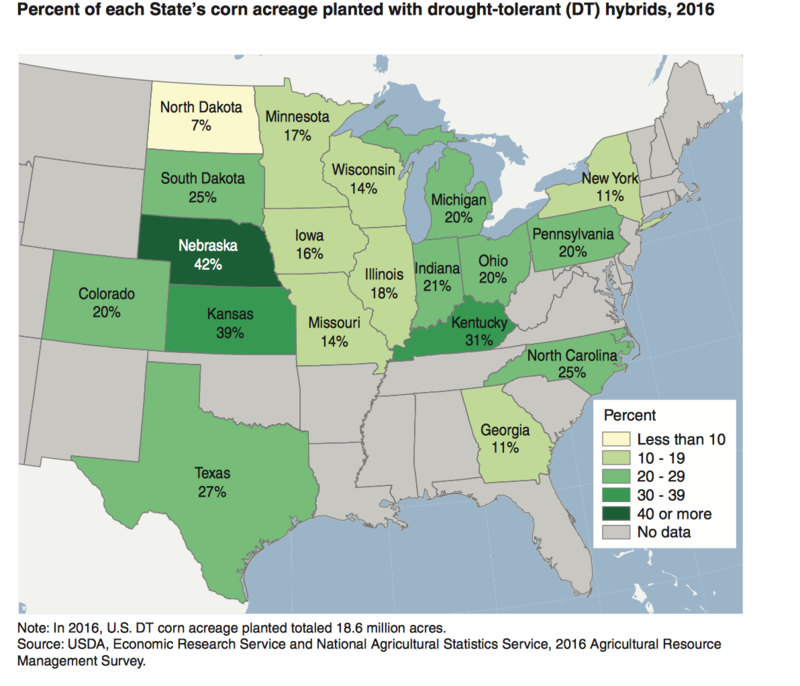 Over one-fifth of U S corn acreage was planted with DT corn in 2016. 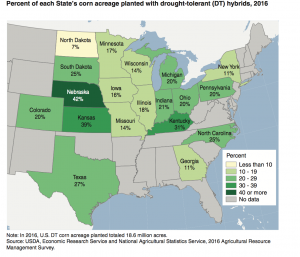 DT corn accounted for only 2 percent of U.S. planted corn acreage in 2012. By 2016, this share had grown to 22 percent. 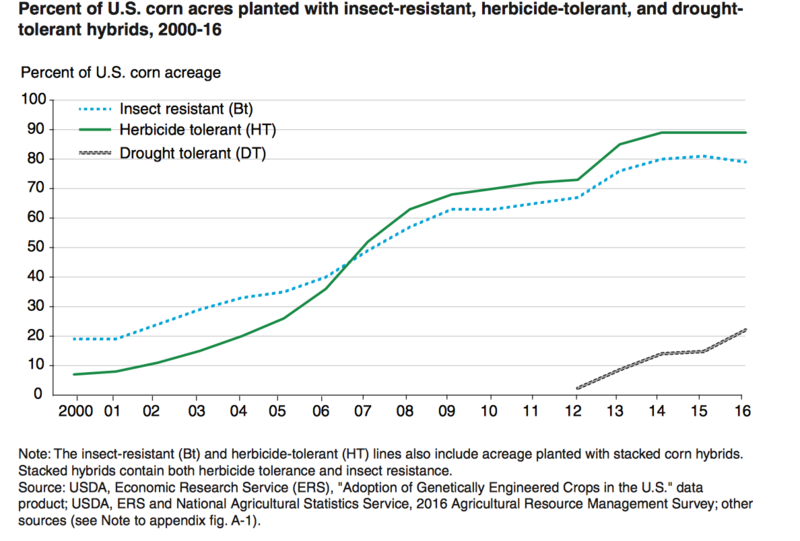 The pace of adoption is similar to the adoption of herbicide-tolerant corn in the early 2000. McFadden, Jonathan, David Smith, Seth Wechsler, and Steven Wallander. 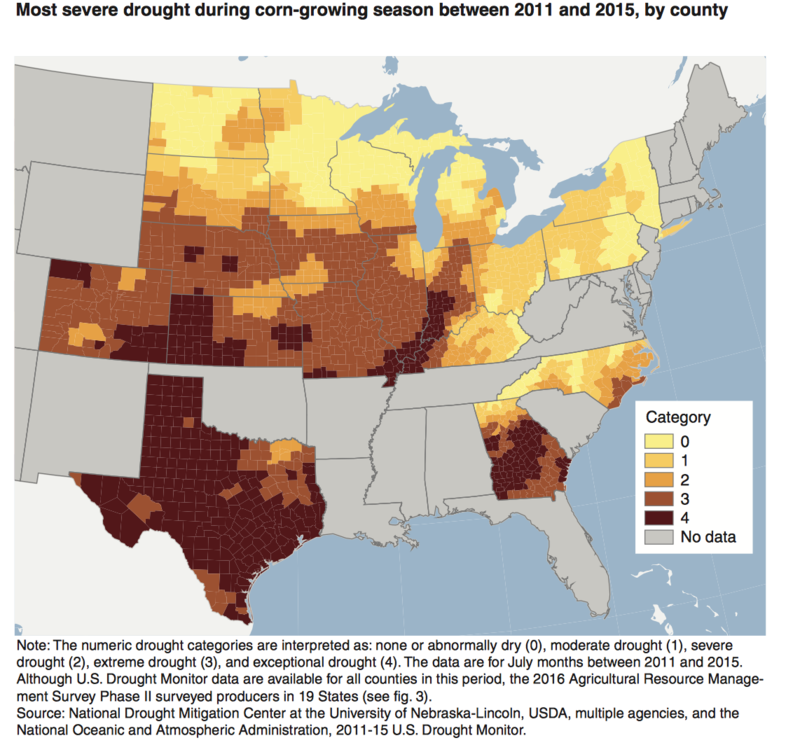 Development, Adoption, and Management of Drought-Tolerant Corn in the United States, EIB-204, U.S. Department of Agriculture, Economic Research Service, January 2019. 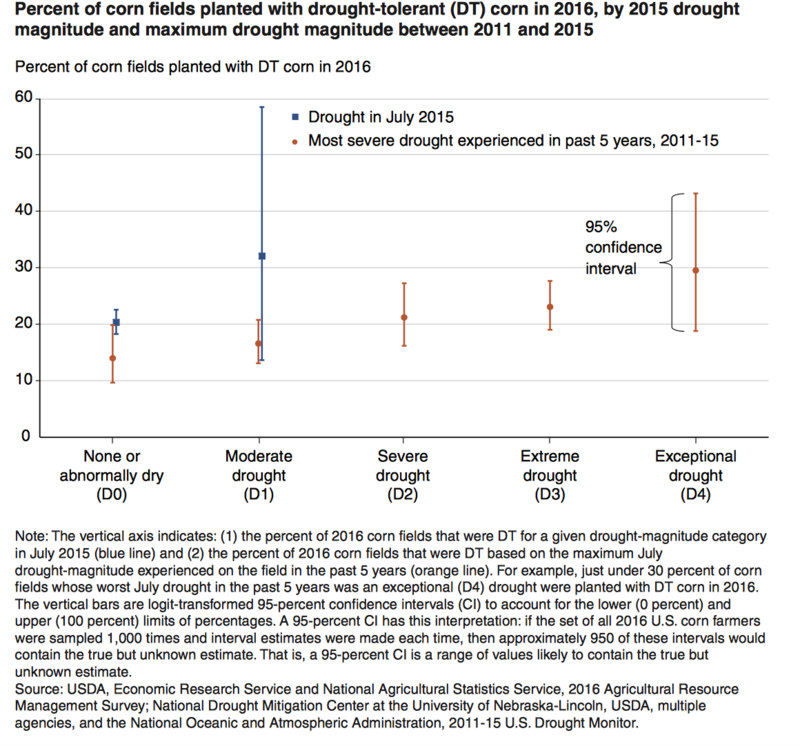 Following this point, the ERS report noted that, “Regional differences in drought severity and recentness of exposure significantly influence adoption of DT corn. Only 14 percent of fields located in areas that did not experience a July drought (i.e., none or abnormally dry classifications) from 2011 to 2015 were planted with DT corn in 2016. By contrast, 30 percent of corn fields located in areas where the most severe July drought was ‘exceptional’ (i.e., D4 classification) at some point between 2011 and 2015 were planted with DT hybrids in 2016. The authors added: “The decision to plant DT corn can be likened to farmers’ decisions to purchase insurance. Under mild-to-moderate drought conditions, planting DT corn can ‘pay out‘ in the form of reductions in drought-induced yield losses. Farmers who adopt DT corn value the expected avoidance of such yield losses at least as much as the premiums they are willing to pay for the DT technology. However, DT seeds provide incomplete protection from drought, and substantial losses could result under severe conditions. 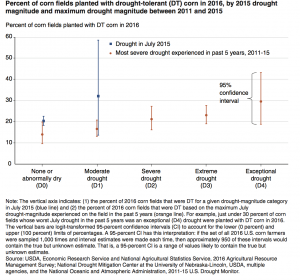 Under extreme or exceptional drought, there could be little expected benefit to adoption since both DT and non-DT corn are likely to suffer crop failure. 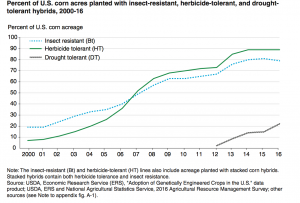 “Yet, there remain conditions under which DT corn may be an effective risk-management tool.